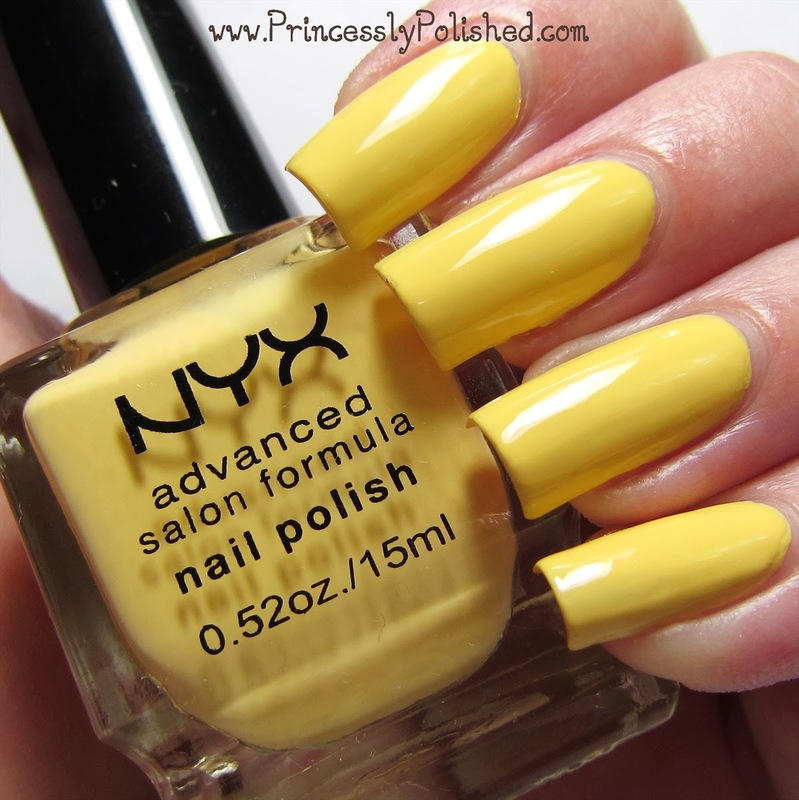 Princessly Polished: Nyx Advanced Salon Formula Nail Polish - the Pastels! Nyx Advanced Salon Formula Nail Polish - the Pastels! I present to you swatches of Nyx Advanced Salon Formula: Pastel Yellow, Pastel Pink, Pastel Blue, Pastel Coral, Pastel Pistachio, Pastel Mint, and Pastel Lavender. Let me start off by saying that I added a bit of nail polish thinner to all of the polishes because they were slightly thick, and I wanted them to be flowing a little better! Not sure if this was because of sitting around or if these are all normally thick polishes. This buttery yellow wanted to photograph a bit more vivid than it looks in person. I had to use 3 coats for opacity, it looked streaky otherwise. My topcoat helped to level the color out better. I can't fault a pastel yellow for being a 3-coater, they usually are. The color is very nice (a bit warmer than China Glaze Lemon Fizz). This polish stands out as the lone shimmer in this group of pastels. I could tell from the Online swatch that it wasn't going to be a plain creme finish, and was hoping for a hidden-shimmer creme instead. This is more of a pink jelly with ultra fine pinky-purple shimmer. I was surprised by how much I ended up liking the shimmer and even the color (I'm picky about pink polish), but the formula leaves much to be desired. This wasn't as thick as the other pastels, but it was super sheer. It went on streaky, patchy, blah... Took 3 coats to look decent and 4 for me to be happy with the effect on my nails. Shorter nails could be okay with 3. I'm torn about this one. The squishy jelly effect is pretty, and the shimmer is brushstroke free... but I don't have patience for 4 coats of one polish! This is one of the colors I was most hopeful about, and I wasn't let down. It is the best polish out of this pastel bunch. Despite how pale a blue it is I only needed 2 coats, and it was the most willing to self-level out of all these colors. I added topcoat and that only made it look more perfect! I really love this light powder blue, and I think it will be a great base color for nail art. I don't often go for coral, but I did want to add a not-too-bright shade to my stash for nail art. This color fits the bill nicely. It's a pigmented true coral without being an eye-searingly bright shade or too warm for my skin. On the note of pigmentation, this one did want to stick to my cuticles at removal time. It took a little more remover than the other shades did to completely rid myself of its coral tinge. This polish was thick and didn't want to self-level, so topcoat is a must. This really is pistachio green! While the color names aren't super creative at least they are spot-on... The coverage was good for a light green, good at 2 and surely better with 3 coats. It is also on the thick side and needed topcoat to level it out more. So, not the perfect polish but fully tolerable for a shade that is usually finicky. Nyx gave us blue, green, and blue-green here! Sitting next to Pastel Blue this definitely has a minty green cast, so it isn't too confusing. I like the shade but can't say that is the most spectacular mint ever. It did have good coverage, though. It also leveled out with topcoat. This is a red-toned (but not pink-y) pastel purple. I have several lavender shades but can't think of an exact dupe for this one. I really like the color and I think it would work for most skin tones. Once again this polish was quite pigmented and only needed 2 coats, but needed topcoat to level it out better. Here is what I can say about all the polishes: They have very low odor; I hardly noticed any polish smell at all. They remove easily. I love the square bottles which are sturdy and store wonderfully. The wide, flat brushes are easy to work with. (Pastel Pistachio and Pastel Mint each had a stray long bristle, but I didn't need to trim it before use.) And yes, they all had to be thinned. (Pastel Pink was the least thick of all, but it was also a shimmery jelly instead of a creme.) Rather than be watery pastels these seem to be so loaded with pigment that they are thick and not really good at leveling themselves out. I can't really be upset about needing topcoat with most of these when I always use it anyway, but of course I'd prefer for these to have a smoother finish. I am most impressed by the fact that I couldn't find dupes for any of these in all the pastel polishes I already own! They are pastels, though, and it probably isn't good to judge an entire line by just these. Am I inspired to buy the rest of the Advanced Salon Formula line? No. But I will pick a color up if I'm curious about it... and it doesn't have a dupe for half the price in the Nyx Girls line. What do you think? If you own any Advance Salon Formula polishes let me know which ones they are and what you think of them, thanks! I have that pastel blue polish and love it!